Alan Travis is no stranger to restoring the rarest automobiles and entering them in the Great Race. He and his wife, Mary, campaigned a 1910 Knox Raceabout for many years in the Great Race, and they won in it in 1993. Alan and Wayne Stanfield won in a 1916 Mitchell in 1987. 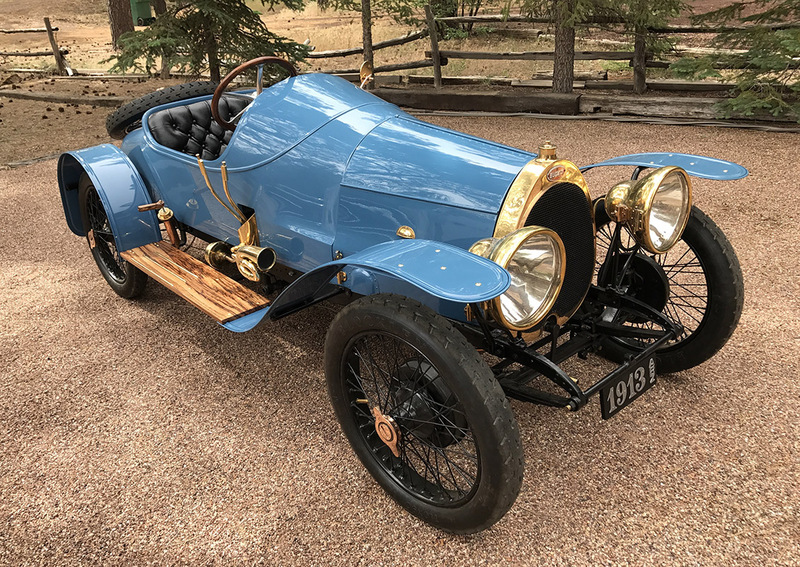 But Alan may have reached a new pinnacle with his 2018 Great Race entry  a 1913 Bugatti. Not only will it be the oldest vehicle in the 2018 Great Race (and the oldest Great Race vehicle of any kind since 2012), it is the oldest Bugatti in use in the world. The car is so perfectly restored that it caught the attention of Jay Leno, and he made it part of his program, Jay Lenos Garage. The show lasts for more than 30 minutes, mostly because Jay was so excited to be around the car. You can view the entire show at the link below, and notice the Timewise speedometer in the dash at around the 17-minute mark. for the record, i would argue that this is not the oldest bugatti in use in the world. there is another a bit older, restored by my father and now living in italy which is used. Kudos to alan for getting this one up and running, we hope to see all of you when you come through maine! I know there are at least 3 or 4 older than mine and maybe more. Keeps changing. I have been correcting sites all week. I am looking forward to seeing this Bugatti in Troy, NY on June24th when the Great Race comes through. I’ll be presenting the story of the 1903 Automobile Endurance Run to the racers. I enjoy sketching Bugattis and may get the chance to draw this one, it would be my oldest Bugatti. The Great Race is a beautiful showcase of classic cars on a 2,000 mile road trip. Designed decades ago, this kind of adventure can only be done by people who love them. I brought my family to Newnan, GA and parked at the downtown square. Over a hundred finely tuned machines rolled in and parked for their lunch break. After a walk around and a box lunch, the teams drove on towards their next checkpoint. Do not miss the opportunity to see this event if it comes near you. Every entry has a story, be it a century old Bugatti, 40s Power Wagon tow truck built by a high school shop class or a familys restored station wagon driven by siblings. Everyone has to pay close attention to their navigation and know their vehicle well enough to keep going. Im inspired by this event and plan to compete when my navigators and our equipment are old enough. Wow!!! Jeff Stumb told me all about the Bugati, however a picture (well video) is worth thousands of words!!! Truly a beautiful car and I simply cannot wait to see it see in Moncton, NB for the City Stop over on June 29th. We would be super pleased to welcome you and your Bugatti back to the Atlantic Nationals the following week.. July 4 – 8 for our eighteenth annual Atlantic Nationals Automotive Extravaganza!! The race was just over whelming. I hope it can continue,but the rate old cars are being taken off the original scene, it will have an ending. I’m so glad I found this video–so great to hear the sound of the engine! My grandmother had a 3 seater version of this car in Boston in 1915 (engine no. 500 according to theoldmotor.com http://theoldmotor.com/?p=7688 ), and I’m wondering how to find out more about how she must have purchased it. Her family was in Germany and France in 1914, so do we assume she bought it there and shipped it home? Where are the Bugatti archives? My father always said that her brother secured the Bugatti franchise in the US, but I can’t find anything to confirm that fact. I’d appreciate any help anyone can provide! It was so great to meet you and your friend at the Ole Rhinebeck Aerodome this past weekend! Kudos to you and your wife on a wonderful restoration and helping educate the world on this beautiful piece of history. I hope to see more of your restorations.